Programming note: We’ll release a special Crystal Ball Sunday night with a recap of the second presidential debate. As we await the second debate, it’s obvious that Hillary Clinton got a bounce from the first debate and has re-established a clear lead in the presidential race. Her national lead in the RealClearPolitics average has gone up at least a couple of points since the debate (to about four points nationally in two- and four-way ballot tests), and it has increased to more than five points in the HuffPost Pollster average. She has arrested her September decline and has grabbed a lead that suggests she could match or even exceed Barack Obama’s 2012 victory (four points nationally and 332 electoral votes). But her path may look slightly different than Obama’s. 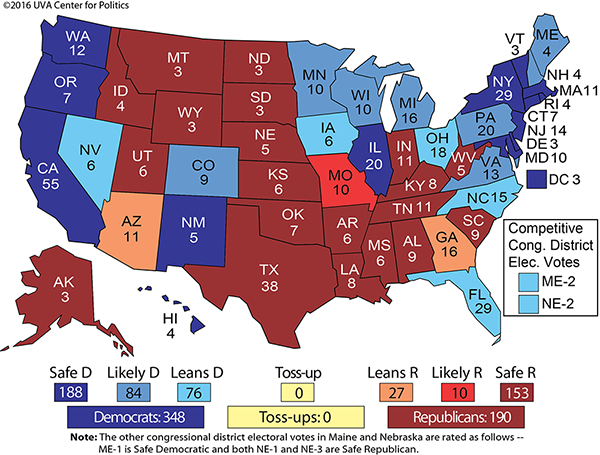 While we have had Clinton as a favorite to win the White House ever since we released our first Clinton vs. Donald Trump electoral map back in late March, we decreased her chances a few weeks ago, moving her from 348 electoral votes at least safe/likely/leaning to her (with 190 for Trump) to a map where she only had 272 safe/likely/leaning. So we had her over the magic number of 270, but just barely. Our Electoral College changes this week are considerable. Now we have Clinton back above 300 electoral votes and solidifying her hold on some states after her highly successful debate and Trump’s repeated stumbles, in and out of the debate hall. So while we’ve always had Clinton ahead of the 270 mark, she’s in a much better position now. Although polls are still close in Florida and North Carolina, it appears that Clinton is opening up a little bit of a lead in both. She’s up about three points in Florida and she’s edged ahead by just about a point in North Carolina. Both states are beginning to report early and absentee voting statistics, and while it may be too early to draw conclusions about Florida (where Clinton’s polling lead is clearer), North Carolina’s early numbers suggest Democrats are slightly improving on their numbers from four years ago. (Barack Obama won Florida by less than a point and lost North Carolina by two). Here’s where Clinton’s better-funded turnout operation might come into play in diverse states where running a strong ground game requires months of preparation and millions upon millions of dollars. It may also be that Trump has less room to grow in states like these because the white voters without a college degree in those states are already so Republican. These voters seem to be moving toward Trump in this election, but whites in the South already were more Republican than the national average and thus Trump may benefit less from his appeal among that demographic along the Atlantic Coast. That’s less true in whiter, Midwestern states like Iowa and Ohio, which we are holding at Leans Republican despite Clinton’s national improvement (the Crystal Ball’s Kyle Kondik, author of The Bellwether: Why Ohio Picks the President, took a closer look at Ohio this week and argued that Trump will do better there than he does nationally.) There has not been much post-debate polling of either Iowa or Ohio. Dueling Quinnipiac (Trump up five) and Monmouth (Clinton up two) polls suggest a close race in Ohio, while we haven’t seen any new numbers from Iowa post-debate. It may be that these states will head back toward Toss-up as we get more information, but as of now we see Trump maintaining a small edge in each. The same goes for Maine’s very white, blue collar Second Congressional District, which we also lean to Trump. The Atlantic’s Ron Brownstein, who is as shrewd an observer of the Electoral College as there is, recently wrote about how the Trump nomination might have sped up changes that were already likely to happen over time: Namely, that the whiter Midwest would lean more Republican while the more diverse and faster-growing Atlantic Coast states would trend Democratic. However, there is little sign that Trump is making progress in some other states that the Crystal Ball rates as Leans Democratic. Clinton’s lead in Pennsylvania appears solid right now — she’s been up four, nine, and 10 points in three post-debate surveys, and Trump appears to be toxic in the Philadelphia suburbs, which more than makes up for whatever improvement Trump may make over Mitt Romney’s 2012 showing in more blue-collar parts of the state. There’s also no indication that Trump is improving in Michigan, New Hampshire, or Wisconsin (if anything, he’s also declining in those states, too, although there aren’t many new numbers in those places). 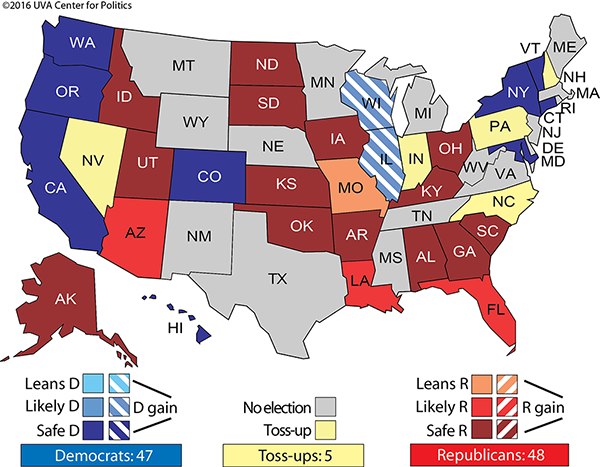 Although we’re keeping these four states, all of which have voted Democratic in at least the last three presidential elections, in the Leans Democratic column, they are closer to being Likely Democratic than to being Toss-ups. Practically speaking, Trump probably can’t win unless he carries at least one of those, and maybe two. That’s because Colorado and Virginia, two growing, highly-educated states that George W. Bush won twice, have never looked all that promising for Trump. A few pre-debate polls showing those states closing were probably a mirage, and more recent surveys have shown Clinton building a bigger lead. Given the demographics of this election — Trump running stronger with non-college whites but losing ground with white college graduates and potentially nonwhite voters too — both of these states should end up voting more Democratic than the national average. They move from Leans Democratic to Likely Democratic. One interesting development in Colorado is that Democrats have taken a lead in statewide party registration for the first time in three decades, and this also will be the first presidential election with all-mail voting in the state. These two factors make the state even more of a reach for Trump. Aiding Clinton in Virginia, besides the state’s long-term trend toward the Democrats and favorable demographics in this specific election, is Sen. Tim Kaine (D-VA), Clinton’s running mate. Kaine is probably giving Clinton an extra point or two in Virginia, as is common for running mates in their home states. We doubt that Tuesday night’s vice presidential debate at Longwood University in Farmville, Virginia moved the needle much one way or the other. The news is not all bad for Trump, though. A couple of small states might be trending more competitive. Trump already apparently leads in ME-2, but the entire state of Maine may also be close. Clinton will win ME-1, the more affluent and liberal southern district that contains Portland, but several statewide polls only show Clinton with a modest lead. Might Maine vote more Republican than New Hampshire this year, something that hasn’t happened in more than half a century? It’s possible given the particulars of this election plus Trump’s overperformance with non-college whites but underperformance with college whites: The Republican research and analytics firm Echelon Insights estimates that more than two-thirds of Maine’s electorate will be made up of whites who do not have a college degree, but those voters will be only about half of New Hampshire’s. We’re moving Maine’s two statewide electoral votes from Likely Democratic to Leans Democratic. So, just to be clear, Maine has four electoral votes — and three different ratings. The two statewide EVs are Leans Democratic, while ME-1 is Safe Democratic and ME-2 is Leans Republican. Additionally, some polls have shown New Mexico close, with former Gov. Gary Johnson, the Libertarian nominee, getting an outsized share of the vote. The Land of Enchantment has the highest percentage of Hispanic voters in the nation, so Trump has a steep climb here, but perhaps a big-enough third party vote could cause an odd outcome. We’re moving the state from Safe Democratic to Likely Democratic. As of now, we only list seven electoral votes as Toss-ups: the state of Nevada and the single electoral vote in Nebraska’s Second Congressional District (all other states besides Maine and Nebraska are winner-take-all in the Electoral College). 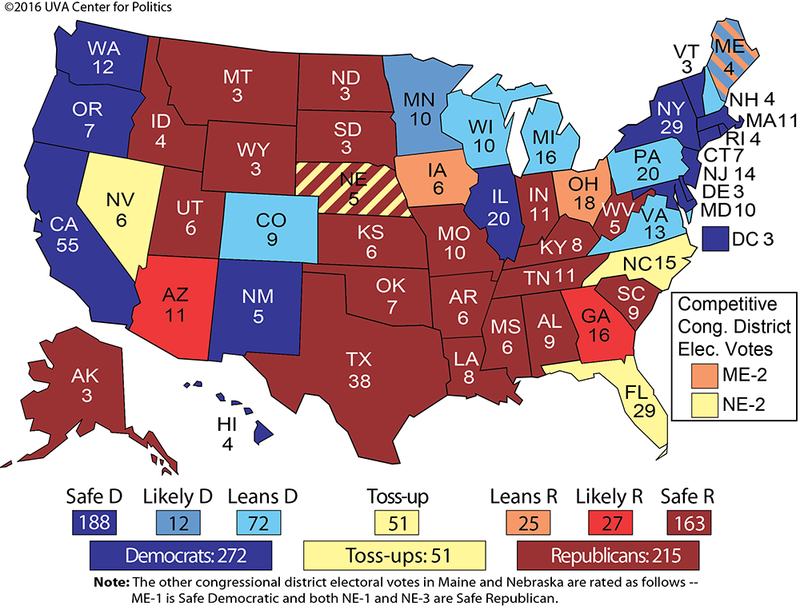 Forced to choose — and we’ll eliminate all Toss-ups by Election Day — we’d probably pick Clinton in both Nevada and NE-2. If that’s how it worked out — the two Toss-ups going to Clinton and all else on our map remaining the way it is now — Clinton would win 323-215 in the Electoral College, along the lines of Obama’s 2012 victory. Trump needs to hope that Clinton’s post-debate polling bump — much like Mitt Romney’s in 2012 — was a mirage. The challenge for him is that Clinton has basically been leading the entire duration of the race, while Romney was trailing for most of his contest. In the Electoral College, Florida and North Carolina are moving together, in our eyes. But they are diverging in the Senate, where one incumbent finds himself in a very close race, while another is strengthening his position. Now that we see Clinton as a narrow favorite in North Carolina — which is how we’d also describe state Attorney General Roy Cooper (D) in his highly competitive challenge to Gov. Pat McCrory (R) — we’re moving the Tar Heel State’s Senate race to Toss-up. Sen. Richard Burr (R-NC) is a frequently-underestimated incumbent, but ex-state Rep. Deborah Ross (D) appears to be giving him a tough challenge, and Republicans have been grumbling for months about Burr perhaps taking the race a little too lightly. North Carolina has a long history of intensely competitive Senate races, and it often votes out incumbents — some recent examples include ex-Sens. Kay Hagan (D, who lost in 2014), Elizabeth Dole (R, 2008), Lauch Faircloth (R, 1998), and Terry Sanford (D, 1992). Additionally, Burr might well have defeated ex-Sen. John Edwards (D) had Edwards run for reelection instead of joining John Kerry’s presidential ticket in 2004, and controversial Sen. Jesse Helms (R) routinely had tough races. If Clinton does in fact win North Carolina, there’s an interesting historical fact working against Burr: North Carolina has only voted differently for president and Senate in a presidential year once since the advent of popular Senate elections: In 1968, Richard Nixon won the state while Sen. Sam Ervin (D) won reelection. We’ve long thought Burr would perform the best of the three Republicans running in the top-tier statewide races in North Carolina (McCrory and Trump are the others). But a Democratic sweep at the top is at least in play. Outside money is flooding into North Carolina, and Democrats appear to be reconfiguring their spending to target states like North Carolina at the expense of states such as Florida and Ohio: The Democratic Senatorial Campaign Committee has cut its spending in the latter two states. We already list Sen. Rob Portman (R-OH) as Safe Republican, and we’re upgrading Sen. Marco Rubio (R-FL) from Leans Republican to Likely Republican. As we’ve previously noted, Rubio is competitive with the state’s significant Hispanic vote while Clinton appears to be matching or exceeding Barack Obama’s 2012 20-point margin with that demographic. If Republicans hold the Senate, Rubio’s late decision to run for reelection may have been the key turning point. But, as of now, there are two near-guaranteed seat flips from GOP incumbents to the Democrats (Illinois and Wisconsin) as well as five Toss-up Senate races: Republican-held seats in Indiana, New Hampshire, North Carolina, and Pennsylvania, as well as Democratic-held Nevada. In order to guarantee a 51-seat majority, Republicans need to win three of the five. That will be very difficult if Trump’s post-debate polling deficit doesn’t improve.